Turn flat mono guitars into huge stereo leads or have your single channel synthesizer fill out the sides of your mix with pseudo stereo. 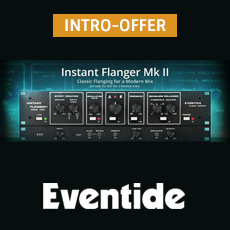 The Instant Flanger Mk II has dual outputs that create three different sonic images - “Shallow”, “Deep”, and “Wide”. Combining “Wide” Mode with the “Low Cut” control is an easy way to place multiple harmonies behind the lead. Fine-tune the resonance of your flanging effect by using the “Depth” and “Feedback” controls.